The growth rate of Norway spruce trees vary depending on soil and weather conditions. They are considered fast growing trees and should only be planted in open areas with sufficient room to accommodate their mature height and base width. Never plant Norway spruce near buildings since they will quickly become large enough to cause damage to siding, roofs and foundations. 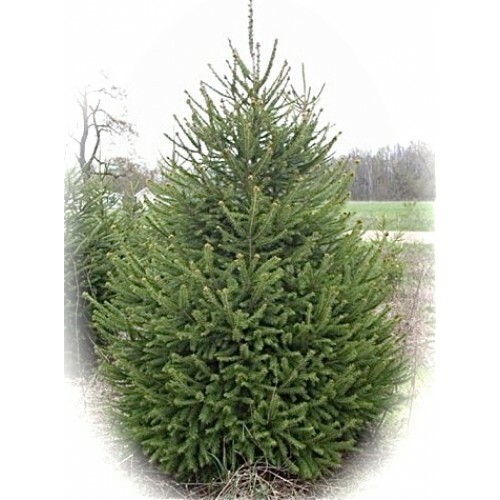 Norway spruce prefers a soil ph of between 5 and 7.5 and a minimum of about 35 inches of rainfall per year. Under these conditions the trees will grow 3+ feet per year in height. The needles are round rather than flat and dark green in color when the tree attains a height of 20 feet. The most popular tree for the annual Rockefeller Center Christmas display in New York City, the Norway spruce can attain base diameters of 40 feet and heights of over 100 feet. While the tree will grow more than three feet per year in optimal conditions, it is quite hardy and has been recorded growing in soils with a ph of 9. Provided it has enough moisture, it will grow under these less than perfect situations, but the growth may be dramatically slowed. Poor soil conditions may also cause the foliage on the tree to be less dense and the base of the tree to be more narrow than is common for Norway spruce. The Norway spruce has a life span of about 100 years depending on conditions. This is a relatively short life for a tree and may be due to its very fast growth rate. As a rule, evergreens are shorter lived than deciduous trees which grow more slowly. The tree is disease resistant and is often used in windbreaks since it can tolerate winds of up to 100 miles an hour without suffering serious damage. The trees do not make good indoor Christmas trees since the warm, dry indoor conditions cause them to drop their needles rapidly. The most serious threat to well established Norway spruce trees is browse damage from deer and rabbits. While the branches do not taste good and deer do not usually eat the trees, bucks in rut will rub their horns against the trees and can cause extensive damage. Rabbits do not seem to have the sophisticated palate of deer and will nibble away lower branches during winter months. Trees should be checked during winter and early spring for browse damage. The Norway spruce growth rate is fast and this makes it a good choice for large areas which landscapers want to fill in quickly. It is hardy in most growing zones in the United States and is an excellent choice for windbreaks or to fill in large open areas. When provided with optimum soil and rain conditions, it will quickly become tall, wide and dense.